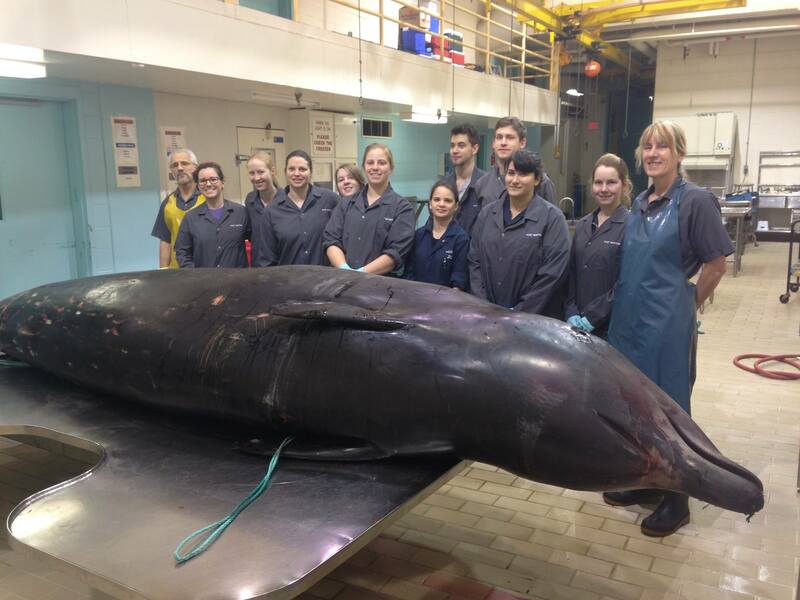 CWHC Atlantic and students of the Atlantic Veterinary College (AVC) recently had the rare opportunity to perform a necropsy on a Cuvier’s beaked whale. The whale was found stranded on a beach in New Harbour, NS. When the Marine Animal Response Society (MARS) arrived at the scene, they were surprised to find that the whale was of a species never before found stranded in Atlantic Canada, except perhaps for one case on Sable Island, more than 150 km offshore from Nova Scotia. This species spends its time well offshore in water depths of 1,000 to 2,000 metres. New Brunswick Museum (NBM), with the help of Department of Fisheries and Oceans (DFO), MARS, and the Nova Scotia Museum, made arrangements to secure the whale’s skeleton for display at their ‘Hall of the Great Whales’. Dr. Donald McAlpine, NBM Research Curator of Zoology, joined CWHC Atlantic’s Dr. Pierre-Yves Daoust and Fiep de Bie, along with many AVC students, in conducting the necropsy to investigate what may have led to the whale’s stranding and eventual death. After the necropsy examination, the skeleton was cut into portions for transfer to Saint John, NB to be cleaned and prepared for display, a long process that involves the work of beetles that eat the soft tissue left on the bones, followed by degreasing and re-assembly. Back at CWHC Atlantic, Dr. Daoust continued his investigation, microscopically studying sections of tissue and looking for abnormalities that might suggest what led to the whale’s unfortunate death. As with many cases of marine mammal strandings, no definitive reason for the stranding was found. There were secondary findings, such as parasitic nematodes in the whale’s kidneys and mesenteric arteriosclerosis (thickened, hardened walls of the arteries carrying blood to the intestines), but the whale appeared to be in good body condition prior to stranding. What are you really stepping in?